Unit Name where production in – process inspection, analysis process are done. Production line name is very important in case of the in the single unit multiple production lines are works. 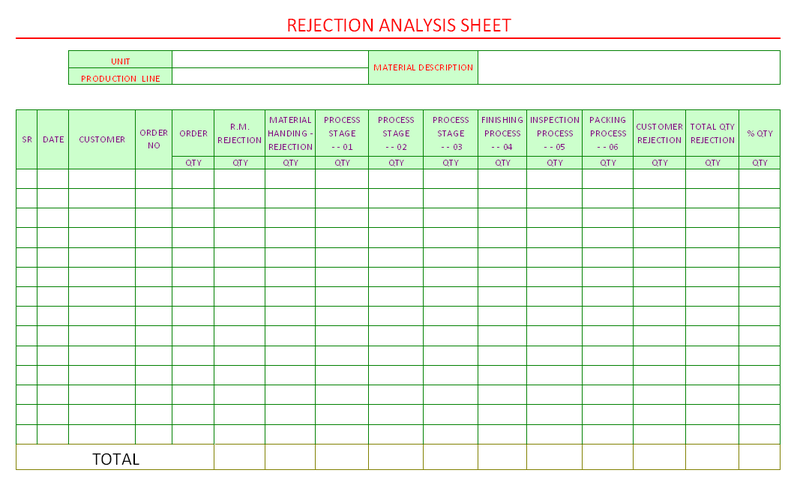 Material Description – Description of the material which on rejection analysis process re being perform. Date of the rejection data, production process are performing in production line, all the data are generally recorded as per date. Name of Customer is not much important if the order number is used as or tracking system. Order number is unique identification number which is generating from marketing department against customer’s purchase order. This Order number is used from beginning to finalization product. Order Quantity – This order quantity is not full quantity of the order, here in meaning of order quantity is the loaded quantity in production line. Raw material rejection – During the material issued against the order, material that rejected during the inspection process of raw material. Material handing Rejection – During the all the process, Raw material to Final packing generated rejection due to material handing are recording in this field. Process Stage – 01 to Process Stage – 03 is sample process stage that can be possible to increased if the real process names are replace by company that used this format for the real used, this is sample process stages hence replace if used for your company for rejection analysis. Finishing process – Finishing process is the final touching of the product, generally in any company having at least single finishing department that individually or in production base are reporting, but its all are perform separately from the production department. inspection Process – this process is the quality control department task that all the final production’s inspection process are done in the inspection process stage, during the inspection process, mostly higher level of rejection are record due to all the possible or standard required all the testing, inspection process are done in this stage. Packing Process – this is the second last stage of the rejection records, packing material process is very important task for the company due to all the process are done with its separate costing and if during the packing process in case of material are damage that all the recent costing plus packing process expenses and its costing will be included in whole order frame, that need care of the packing, in case of any rejection recorded that included in this field. Most companies are afraid during the production line to customer’s rejection, hence the production and quality department awareness is most important to minimize returns. But during the material transportation, material loading and unlading time any material parts are defecting that customer reject to supplier that all the information and quantity rejected is recorded here. Total rejection quantity is calculated in single field. Percentage of the quantity is very important objective for the company, this percentage of the quantity is record against full order of the customer.